The composite roof and wall panels are suitable for a wide range of building projects. Minimum roof pitch is usually 5d, predicted life span of up to 40 years these are an environmentally responsible product. The bespoke range is available for delivery nationwide, in core thicknesses of 40mm, 60mm, 80mm, 100mm, 120mm, 130mm. U value information can be provided upon request. 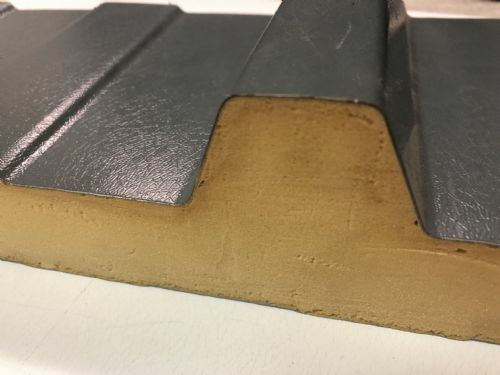 The standard sheet has an external box profile of 0.5mm guage material, the core is to your specification, and the intenal liner is usually a white liner of 0.4mm. The exterior can be in; HPS200 Ultra Colour coat finish, Prisma, Colourcoat LG, Leathergrain Plastisol (most common), and a Polyester finish.